This is the story of the Oxford English Dictionary, a wholly remarkable book. In fact, it was probably the most remarkable book ever to come out of the great publishing corporations of Tri Star and the Oxford University Press. 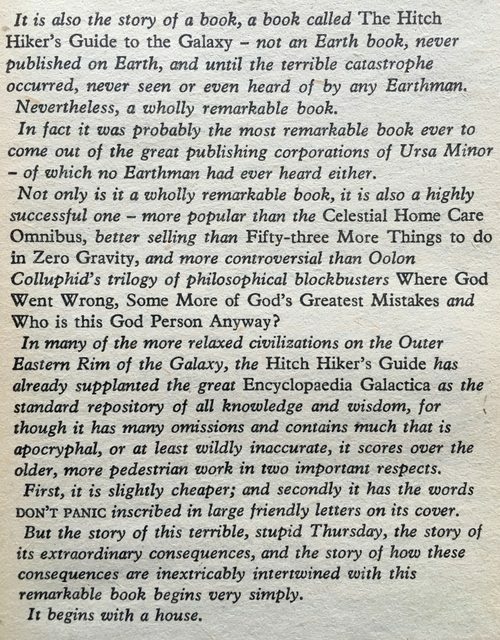 Not only is it a wholly remarkable book, it is also a highly successful one -- more popular than The Concise BBC Microcomputer Service Manual, better selling than Mike Cook's Fifty Things To Do With A Soldering Iron In Zero Gravity, and more controversial than Dot Star's trilogy of philosophical blockbusters Why JGH Was Wrong, Why MartinB Was Wrong, and Does It Really Matter Anyway? The story of a terrible, stupid Friday, the story of its extraordinary consequences, and the story of how these consequences are inextricably intertwined with this remarkable book begins very simply. It begins with a Beeb. The Beeb in question was a BBC Master 512 (with 1 Meg upgrade). It sat, temporarily, in Lee's house but actually belonged to Arcadian, for whom Lee was just refurbishing it before it was put up for sale on eBay. So, time was of the essence -- the sale was imminent -- and this Master 512 was the one and only machine in the entire world that I could get my hands on that might just be able to rescue the software that gave you access to the CD-ROM version of the FIRST EDITION of the Oxford English Dictionary, a product that had been missing in action for decades, possibly since shortly after it was first published in 1987. A little background: the SECOND edition (OED2) of the Oxford English Dictionary is the one that's still being sold today, in print and electronic forms. And the in-progress THIRD edition can already be accessed online, which may be the only place it'll ever be available, since the total size of the text is probably too great for it to be commercially successful on paper in the 21st century -- and anyway, the English language is now changing so rapidly that the OED3 would be out of date as soon as it was published. But the digital version of the FIRST edition (OED1) of the Oxford English Dictionary is a rare and fabled beast that I'd been trying to track down for years. It contains the text of the OED as it stood in 1933. Oh, sure, you can buy second-hand copies of all twelve volumes of the print edition if you only care about the original text. But what if you want an electronically searchable version of this historic work? Well, yes, you could torrent the rather strange scan/index hybrid that's out there, but it's an unwieldy six-gigabyte download, whereas the CD-ROM edition developed by the OUP and Tri Star is a much leaner and more efficient product, weighing in at just over 800MB. And besides, it's also a significant and fascinating artefact in its own right: it's the first and only attempt to produce a commercial version of the OED1 in software. It ought to be preserved for posterity. But it had vanished. There was no sign of it. Well, it did have entries in the catalogues of the University of Edinburgh Library and the national libraries of Scotland and Wales, but when I contacted them they all sheepishly admitted that their holdings were either incomplete or missing! And, incredibly, even Oxford University Press themselves couldn't be of any help. There were a few other mentions of the software online, but nothing concrete. All leads seemed to have petered out. And then, one day, while I was idly scrolling through my Amazon wishlist, gazing dolefully at the long list of gifts that friends, family and well-wishers had utterly failed to buy me, my eyes fell upon an entry that I'd stuck in there almost as a joke. It was an entry for the electronic OED1, which had been unavailable from Amazon ever since I'd first added it, several years ago. Except that today it wasn't. A copy was available from a third-party Amazon seller! I contacted the seller to find out more about the listing, but he could tell me very little because it turned out that the box was still in its original 1987 shrink-wrap! There wasn't any helpful information on the surface of the box, and he didn't want to open it to look inside because that would reduce its value. I found the news encouraging, actually, because if the OED1 software was shrink-wrapped, there was a greater chance it might still be usable, having never been touched by human hands, let alone stuck in dodgy disc-drives and scratched all to hell. I decided to take a risk and buy the item off the seller. Then I sat and bit my nails for several days, waiting for it to be delivered. The parcel arrived. I ripped it open, thirty-year-old shrink-wrap and all. The contents consisted of a licence agreement, a manual, two CD-ROMS in sealed jewel cases, and two 5.25-inch floppy discs. I'd been prepared for the floppy discs, and I would get to them in due course. I *thought* I'd also been prepared for the CD-ROMs -- surely less problematic and more future-proof than floppies? But the CD-ROMs turned out to be a bit of a problem. Now for those floppies. I needed to make copies of those preciousss originals, but I had no computers that had 5.25-inch floppy disc-drives except for my Beebs, and they couldn't read IBM/DOS-format discs. 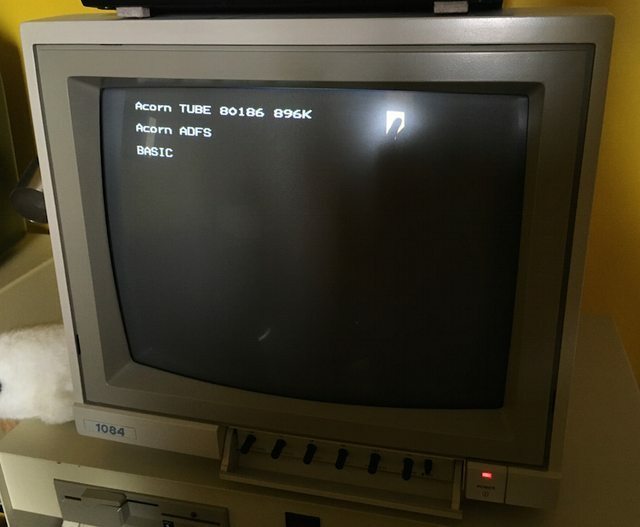 So, one fateful Friday, I swaddled my preciousss electronic OED1 in several layers of bubblewrap and drove over to Lee's house to use the aforementioned Master 512, a supposedly IBM-compatible Beeb that can boot into the DOS Plus operating system. This was only the second time I'd ever used a Master 512 in anger, and so it was to my utter astonishment -- after I'd booted into DOS Plus and, with an unsteady hand, inserted the first of two floppies into the dual drive and issued the "dir" command -- that I saw the directory listing appear on the screen as if not a day had passed since 1987. I formatted another blank floppy as an Acorn DFS disc. I then used MOVE.EXE to copy the files off the DOS disc and onto the DFS one. 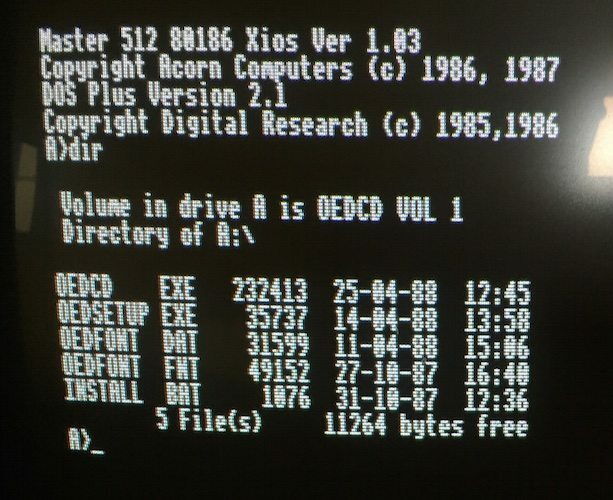 But of course no Beeb ever came with an ADFS-formatting utility built in, and Lee's Master 512 was no exception. And his Master Welcome Disc was corrupt. I sat down and cursed loudly for several minutes. I then rushed desperately to the Internet and thanked the gods of Stardot on discovering that some impossibly angelic soul had uploaded the AFORM program for ADFS. I downloaded the AFORM program and then faffed about trying to transfer it to a DFS .ssd floppy image using Lee's quite-frankly-knackered PC. I copied the .ssd image to a USB stick. 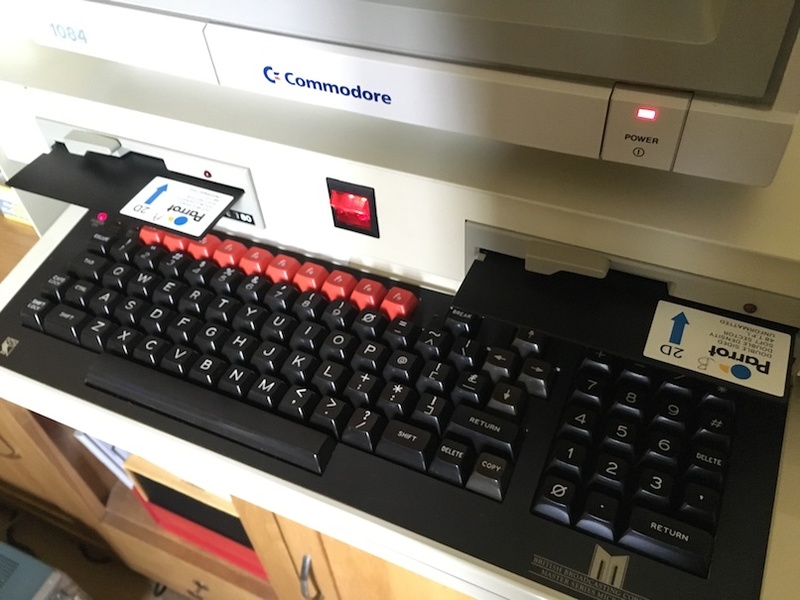 Using one of Lee's many other Beebs, which was equipped with a USB-capable DataCentre, I copied AFORM to an actual DFS floppy and put that floppy into the Master 512's dual drive. I ran the AFORM command to format yet another blank floppy as an ADFS disc, which is the largest-capacity floppy format that any Beeb can handle, as far as I know. And I was finally able to use MOVE.EXE to copy the stubbornly oversized 232k OEDCD.EXE program onto the ADFS floppy! I departed from Lee's in a frazzled and mildly hypoglycaemic daze, barely managing to drive home without crashing. 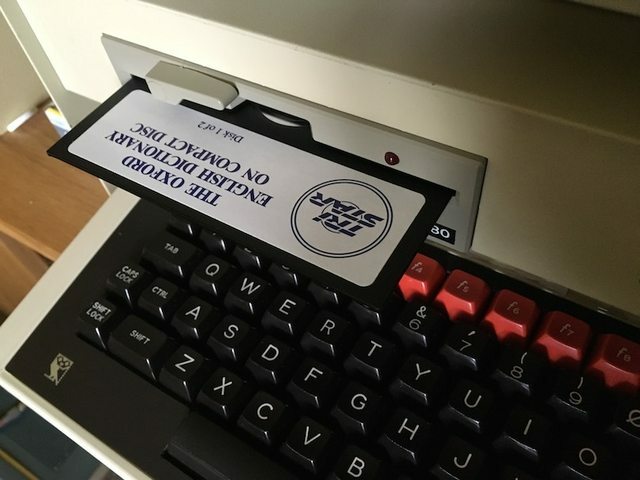 At home, I inserted the DFS floppy into my own Beeb-with-DataCentre. I copied the OED1 files onto the DataCentre's RamFS filesystem. I then realised that the crucial 232k OEDCD.EXE file on the ADFS disc couldn't be copied in one go because, again, it was too large for RamFS to handle! I swore violently for about an hour-and-a-half. Suddenly, inspiration struck! 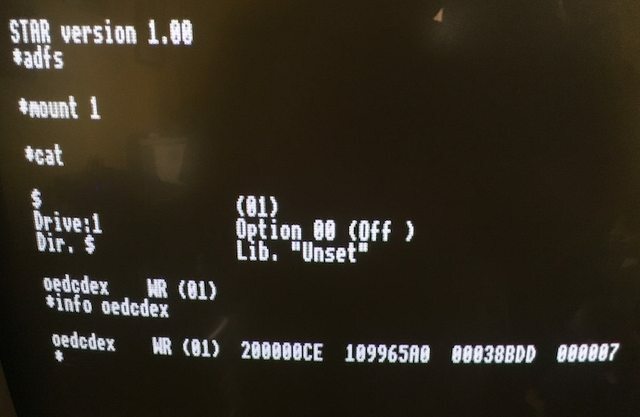 I dug out a Beeb floppy that contained an image of the Advanced Disk Toolkit Disc Doctor ROM and loaded the ROM image into my BBC Master's sideways RAM. 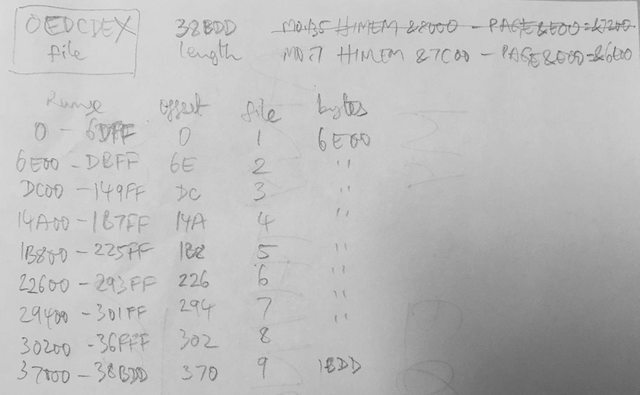 I used the ROM's *PARTLOAD command to split the 232k file into nine smaller chunks. I then transferred those chunks to RamFS and thence to USB, together with the other OED1 files. If nothing had gone wrong -- a scarcely credible prospect, given the incompetence and general cack-handedness with which I'd acquitted myself so far -- the USB stick should now contain all of the OED1 program files from the original floppies, in one form or another. After that ordeal, it was a blessed relief to be able to run a mind-numbingly simple "cat" command on my Mac to join the nine chunks of the 232k .EXE back together again. 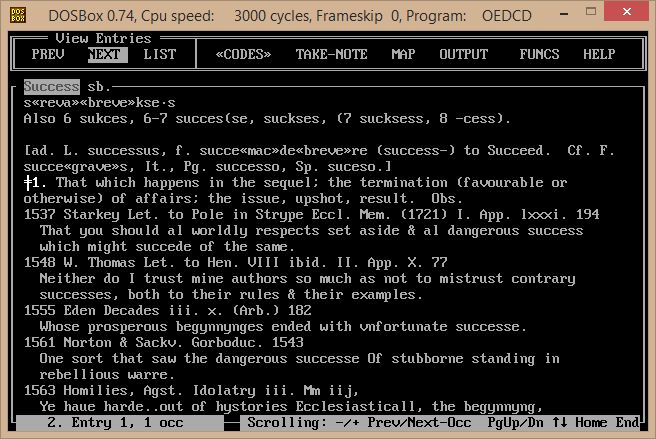 I then loaded it and all the other OED1 program files into DOSBox. I exulted on finding that the programs actually bloody ran! But I then immediately despaired on finding that DOSBox didn't recognise the weird filesystemless CD-ROM ISO images that held the actual dictionary data! I tried again on a Windows PC, but fell at the same hurdle: DOSBox wouldn't recognise the wacky ISOs. So I downloaded Alcohol and used it to create a virtual CD-ROM drive on the PC. 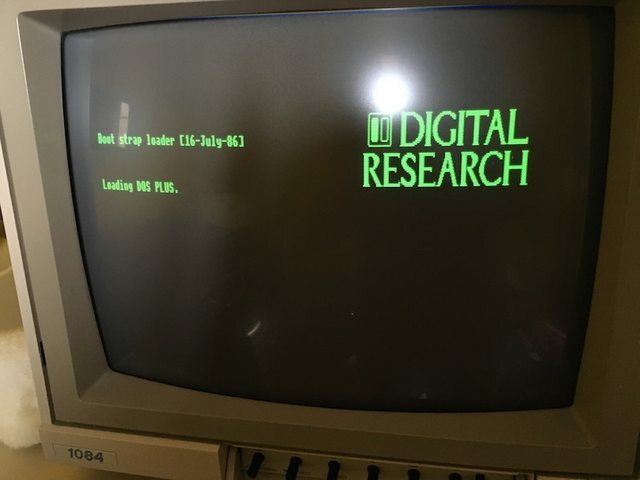 I loaded the first ISO image into the virtual drive, told DOSBox on the PC to use the virtual drive as its CD-ROM drive, and typed in "OEDCD.EXE" at the DOSBox command prompt to invoke the mammoth 232k main program. It effing worked! The program could read the CD-ROM ISO images that contained the OED's headwords, etymologies, and definitions. I passed out from sheer joy and exhaustion. I was later able to get the electronic OED1 working in various other VM combinations on my Mac too. Last edited by lurkio on Sun Apr 15, 2018 10:17 pm, edited 18 times in total. Superb, Chet. Does this mean it will run on a real DOS PC? Oops! I meant Disc Doctor! Thanks. If I ever need to do something like this again, I'll let you know! I certainly won't be going through all that again! Last edited by lurkio on Wed Jan 27, 2016 10:41 pm, edited 2 times in total. flaxcottage wrote: Superb, Chet. Does this mean it will run on a real DOS PC? It should do -- that's what it was originally released for! But I don't have such a PC, so I can't test that original spec. But it does run in a pure DOS VM in VMWare Fusion. Last edited by lurkio on Wed Jan 27, 2016 10:39 pm, edited 1 time in total. But it was "mint in box"! Better to be opened and used as intended than left in the box to rot. Well done on a successful rescue! And an entertaining story (shame the popcorn ran out earlier ). Good to hear about this, it must have been torture! It's always a bit tricky trying to move large files between filing systems. Although I have a Master 512 I don't use DOS Plus for doing any file transfers, I found it far too clunky. In the same machine I have Sprow's DOSFS which I find much more reliable, and because it works as a normal filing system I can have the co-processor switched off and use Essential's CPFS which turns the 512MB into a RAM disc. 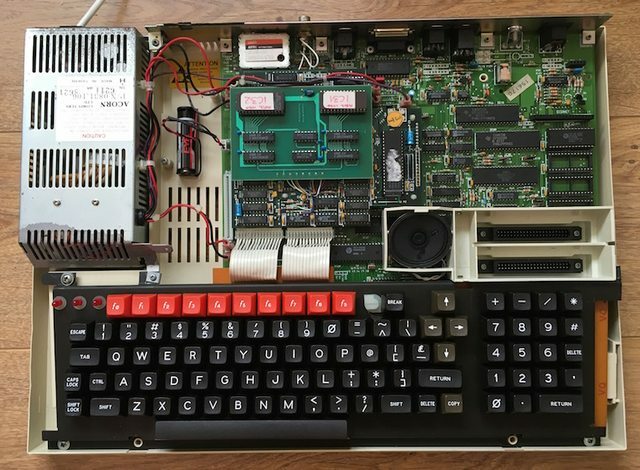 Not related to the OED but would be good to take a look at that addon board for the Co-pro as it would be good to clone it....Arcadian do you still have the machine or have you sold it already? I can't link from my phone but search "master turbo brand new case"
BeebMaster wrote: Good to hear about this, it must have been torture! It was, a bit! But your AFORM upload saved the day! Many thanks. BeebMaster wrote: It's always a bit tricky trying to move large files between filing systems. Although I have a Master 512 I don't use DOS Plus for doing any file transfers, I found it far too clunky. In the same machine I have Sprow's DOSFS which I find much more reliable, and because it works as a normal filing system I can have the co-processor switched off and use Essential's CPFS which turns the 512MB into a RAM disc. Interesting. I've never seen DOSFS, but I did very briefly try out CPFS (in my never-ending quest to find a replacement (DataCentre excepted) for the SFS RAMdisc that went south when the battery leaked all over my Watford SWR board!). CPFS was good, but it turned out you couldn't use filenames that had a dot in the middle (except to denote single-character directories, à la DFS). A bit limiting -- as I found out almost immediately, when trying to copy to RAMdisc some files that exhibited exactly that property (e.g. "$.READ.ME")! ...if you're feeling way braver and cleverer than me! davidb wrote: But it was "mint in box"! Better to be opened and used as intended than left in the box to rot. Well done on a successful rescue! Last edited by lurkio on Sun Jan 31, 2016 12:19 pm, edited 1 time in total. Great story! Humanity should be glad with you. @Lurkio - hello! I've been hunting down the bits to fully run OED2 (I have the CD-ROM but the floppy has gone missing, so finding the right fonts has been a bit of a nightmare) on my Macintosh, and during the hunt came across this incredible story! 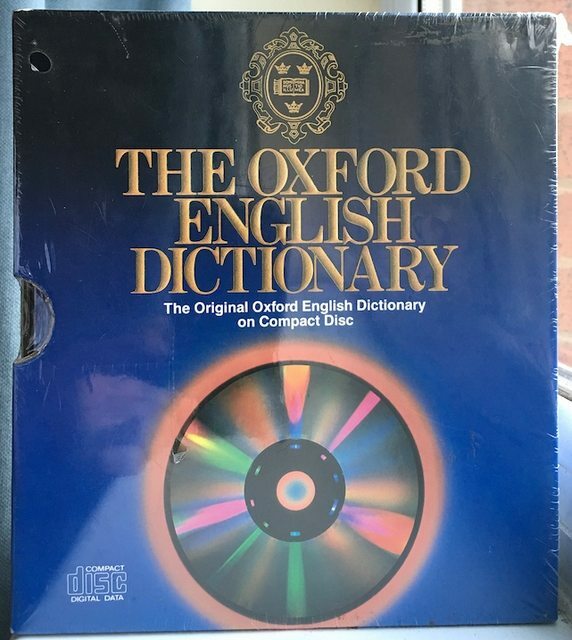 I actually had no idea there was an OED1 on CD-ROM, despite the fact that my dad has worked on the OED since the late 1970s. I grew up using the 20 volumes in my house and the CD-ROM of OED2, all the time having no idea that this wasn't something that other kids had access to! My dad never had a copy of the OED1 CD-ROM or even a way to run it. Is there any chance you could help us out? I'd love to get hold of the VM image you put together if you were OK with that? Please PM me if you want to confirm my identity or anything like that, first etc - this is my first post here, and despite having grown up with beebs in two of my first schools and being the owner of an Electron, I really only joined to ask this! I hope that's OK.
That's a fantastic achievement! Maybe there's a way to archive it as a single-click Windows-compatible DOS shell or something. That'll be well worth archiving for the completists! BONUS POINTS for the Commodore monitor!